Tow what extent have the solutions emerging from this topic been directed at preventing environmental impacts, limiting the extent of the environmental impacts, or restoring systems in which environmental impacts have already occurred? How does a systems approach help in our understanding of unequal access to water resources? To what extent are there solutions for increasing greater access to freshwater resources? Outline the opportunities and barriers to managing freshwater resources sustainably. Suggest how and why, access to freshwater resources is likely to change in the future. Water is an important part of our daily lives and not just for drinking: when we wake up, we might take a shower, or sip coffee or tea; quench our thirst with all types of beverages; water our gardens; wash the laundry and the dishes; and by the end of the day, the average person in a Western society has consumed some 150–200 litres of freshwater.. The household water consumption is a mere teaspoonful in a bathtub when compared with the amount of water used by agriculture and industry. The USA alone uses more than 500 billion litres of freshwater every day to cool electric power plants, and roughly the same amount is needed to irrigate crop fields. Temperature and moisture are among the key variables that determine the distribution, growth and productivity, and reproduction of plants and animals. Changes in climate can influence species in a variety of ways, but the most completely understood processes are those that link moisture availability with intrinsic thresholds that regulate productivity and reproduction. The changes in climate that are anticipated in the coming decades will have diverse effects on moisture availability, ranging from alterations in the timing and volume of streamflow to the lowering of water levels in many wetlands, the expansion of thermokarst lakes in the Arctic, and a decline in mist water availability in tropical mountain forests. ​As populations grow, greater demands are made on water resources. Water resources are now becoming a limiting factor in many societies, and the availability of water for drinking, industry and agriculture need to be considered. Many societies now are dependent on groundwater which is non-renewable. 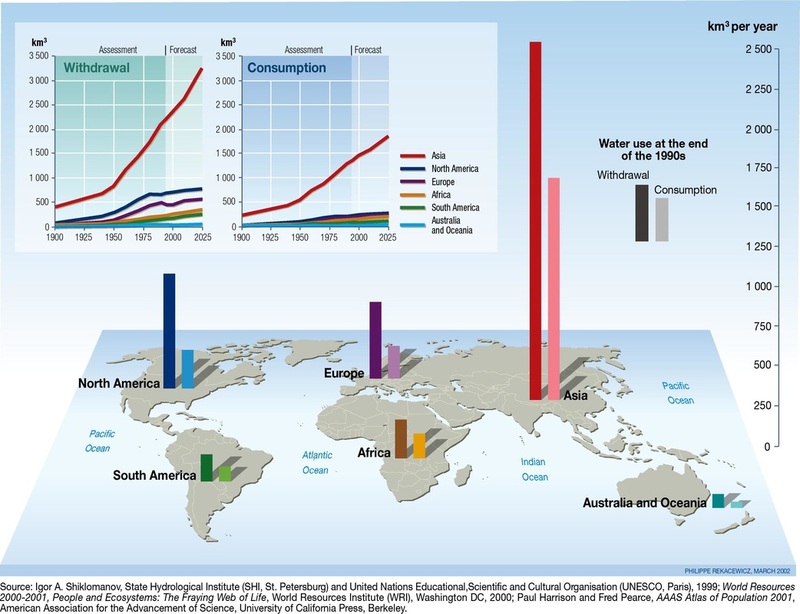 As societies develop, water needs to be increased. 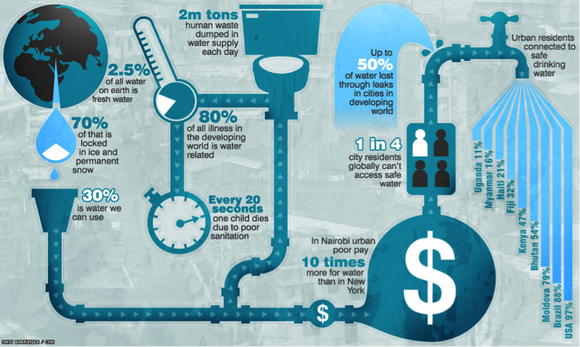 The increased demand for water can lead to inequity of use and political consequences. When water supplies fail, populations will be forced to take dramatic steps, such as mass migration. 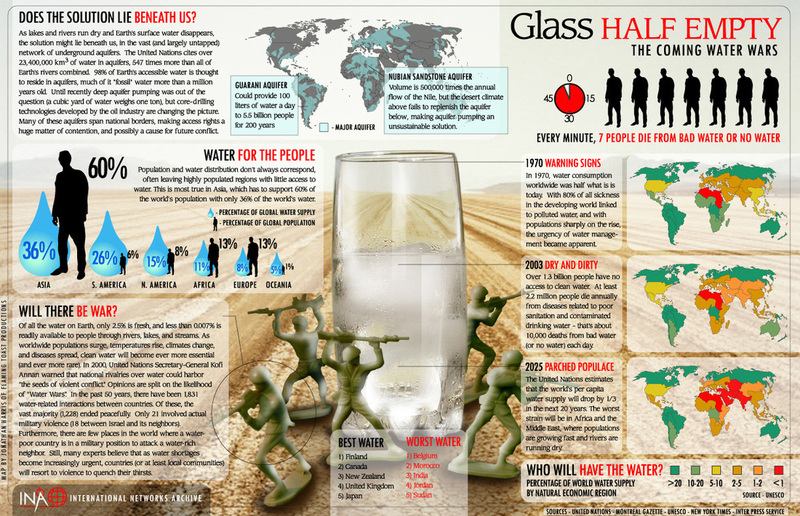 Water shortages may also lead to civil unrest and wars. India has 4% of the world’s freshwater, but 16% of its population. Demand will probably exceed supply by 2020, as urban water demand is expected to double and industrial demand to triple. Hydrologists calculate that 43% of precipitation never reaches rivers or aquifers, and water tables are falling rapidly as 21 million wells abstract water. China has 8% of the world’s freshwater but must meet the needs of 22% of the world’s population. Two-thirds of Chinese cities do not have enough water all year round, and national water supplies are likely to reach stress levels by 2030. China uses irrigation to produce 70% of its food, mostly in the north and northeast, where the Yellow River and major aquifers are running dry. Huge engineering projects transfer water to this area from the water-rich south. Humans must drink potable water. In HICs water can be purified, for example in the Lea Valley, London, where wastewater is cleaned and used to recharge aquifers. Contaminated water carries diseases such as cholera, which is one of the diseases responsible for the high infant mortality rates in LICs. The 7th Millennium Development Goal (MDG7) aims to reduce by half the proportion of people without sustainable access to safe drinking water. This goal can be achieved through reliable supplies and waste treatment technology. With a warmer climate, droughts and floods could become more frequent, severe and long-lasting. 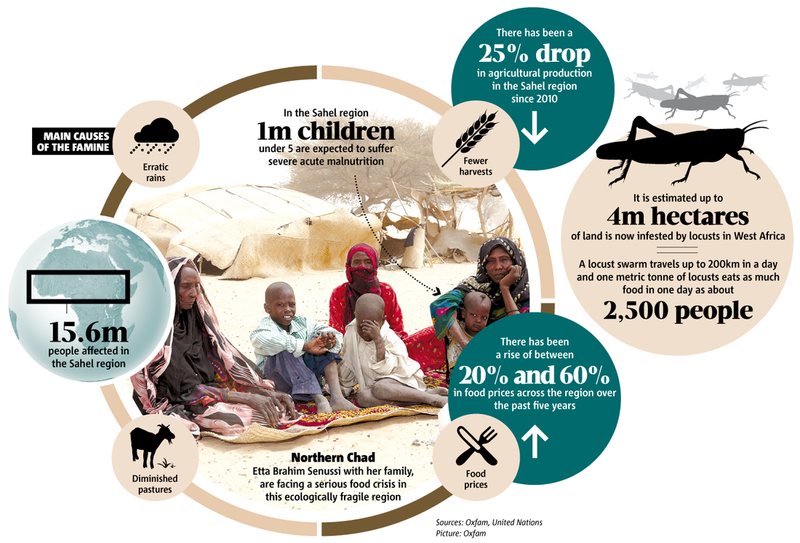 Droughts can have devastating effects on agriculture, livestock and water supplies, causing famine, malnutrition and the displacement of populations from one area to another. The land may become starved of nourishment or contaminated with mineral salts, so that even when it does rain the ground cannot support much vegetation growth. With climate change expected to reduce rainfall in some places and cause drought in others, some regions could become ‘economic deserts’, of no use to people or agriculture. The Pearl River in China is highly polluted. The Delta, which accounts for 10% of China’s GDP, has undergone rapid urbanisation. The rapid growth of cities has contributed to environmental degradation in the Delta. Polluted water is killing crops in the Pearl River Delta. Cities are rich enough to treat the water but they do not allow farmers to use the treated water, so people are forced to drink the polluted water. Those who do fall sick. 9,000 tonnes of heavy metals, 66,000 tonnes of nitrates and ammonia and 60,000 tonnes of petrol are deposited into the sea every year by the river. The World Bank has approved a US$96 million loan to reduce water pollution. Guangzhou has built 30 water treatment plants which aim to cut sewage by 85%. ​Most water-short regions of the world with dry climates have long-standing water conservation traditions. These are being maintained or supplemented with demand-management practices. To meet increased demands, water resource management practitioners are augmenting the limited natural water supply with desalination, water reuse, enhanced groundwater recharge and inter-basin transfers. Rainwater has been collected for thousands of years in many parts of the world. Today, this technique is used in Asia to replenish underground supplies. It is relatively inexpensive and has the advantage of allowing local communities to develop and maintain the required structures themselves. Transferring water between river basins can also help alleviate shortages. China, for instance, already has major interbasin links, and is planning more. The impact of these projects on people and the environment must be monitored closely. When the demand for water overtakes supply and several stakeholders wish to use the same resource, there is a potential for conflict. Competing demands for water for irrigation, power generation, domestic use, recreation and conservation can also create tension both between and within countries. The Middle Eastern water conflicts are exacerbated by low seasonal rainfall and growing population sizes. In the western part of this region, Israelis, Syrians, Jordanians, Lebanese and Palestinians are in dispute over shrinking water supplies. Security of water supplies was not the cause of the Arab-Israeli War, but was a contributory factor. Water in this region comes from two sources: the River Jordan (and its lakes) and three important aquifers. The division of these water resources between the neighbouring states is an ongoing challenge. In the eastern part of the region, Turkey plans to build dams to store and use water in the headwaters of the Tigris and Euphrates Rivers. This is strongly opposed by Syria and Iraq, where reduced water supplies threaten to hold back economic development and food production. The River Danube is a trans-boundary source, but international agreement has stopped conflicts. The Danube flows through 17 countries, and rises in the Black Forest Mountains in Germany and flows for 2,850km to the Black Sea. It provides drinking water for 10 million people and the International Commission for the Protection of the Danube River, comprising 13 member states and the EU, was set up in 1998 to promote and coordinate sustainable and equitable water management, including conservation, improvement and rational use of the water of the river, its tributaries and groundwater sources. The River Nile is over-used, so conflict in the near future is likely. The Nile flows through 10 countries for 6,700km, draining more than 3 million km2, about one-tenth of the entire African landmass, and is formed by three major tributaries, the White Nile, the Blue Nile and the Atbara. The primary problem facing the Nile and the countries has to do with the scarcity and over-use of the water. Before dams were built on the river, the discharge at Aswan varied widely throughout the year. Using water resources sustainably is challenging because of the many factors involved, including changes in climate, the natural variability of the resource, as well as pressures due to human activity. At present, most water policy is still driven by short-term economic and political concerns that do not take into account science and good stewardship. State-of-the-art solutions and more funding, along with more data on water resources, are needed especially in developing nations. To assess the state of our water resources, we must fully appreciate the roles of different parts of the water cycle – such as rain, meltwater from glaciers, and so on. Otherwise, it remains difficult to develop adequate protection and mitigation strategies. Poor water quality and unsustainable use of water resources can limit the economic development of a country, harm health and affect livelihoods. On a positive note, more sustainable practices are starting to be adopted. When managing water resources, more attention should be paid to increasing existing natural resources and reducing demand and losses. The traditional response to rising demand for water was to store surface water in reservoirs, divert flow to dry regions and withdraw groundwater. Now these methods are increasingly supplemented by water reuse, desalination and rainfall harvesting. Certain regions are even going to the extreme of exploiting non-renewable groundwater resources. At the heart of tensions between India and Bangladesh is the water supply from the River Ganges. For most of its 2,500km length, the Ganges flows through India, but the last part of its course takes it through Bangladesh before passing into the Bay of Bengal. In 1974 India opened the huge Farakka Barrage, just 11km from the Bangladeshi border. Further upstream, a series of dams divert water into irrigation systems and many of India’s largest cities use the river to carry wastewater from domestic and industrial sources. Bangladesh is being deprived of much-needed water and has to suffer the effects of India’s pollution of the river. The reduced flow of the river is affecting irrigation and food production. Fish stocks and the fishing industry are declining. Navigation and water-borne trade are becoming harder because of lower river levels, which are also increasing salinization. The delta is eroding because less silt is being carried and deposited. Seawater incursion is increasing as the delta dries out. Unequal access to fresh water can cause conflict between countries that have an abundance of freshwater and those that do not. Aid agencies often use emotive advertisements around the water security issue—to what extent can emotion be used to manipulate knowledge and actions? The global water crisis will be the central issue facing our world this century. We can manage this problem, but only if we are willing to act now. Ania Grobicki, Executive Secretary of the Global Water Partnership, talks about Climate Change and Water Resources Management. 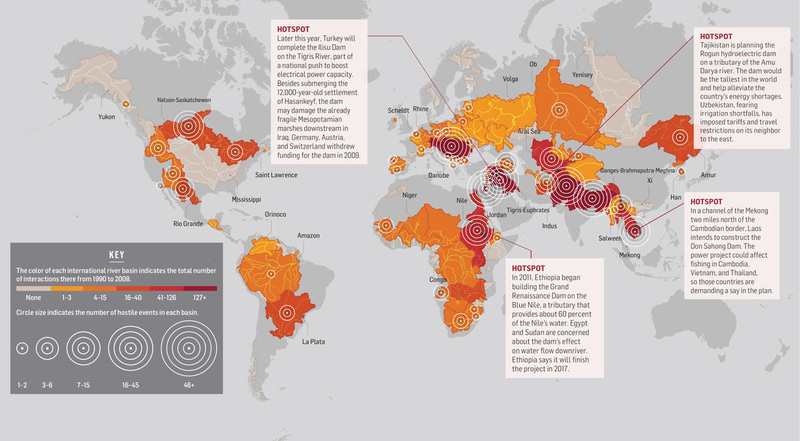 It has been predicted that water rights will be the cause of conflict in the 21st century. But could it be the source of peace? Patrick McNamara highlights negotiations between Pakistan and Afghanistan. ​​​For decades, the mighty Colorado River has been diverted to growing cities and farmland, halting the river's progress to the sea. Now with governments and environmental groups in the U.S. and Mexico working together, there is hope to once again connect the river to the sea.